We've heard it time and time again - details are what "make" the design. Once a space has been successfully designed, the accessories and small details are what complete the overall look. I love, love accessorizing and styling a space! And half the fun is shopping for those special pieces. I also love changing things around my apartment when I feel the need for an update. That's what's so great about having a stockpile of accessories and books - you can mix and match, move things around, add or take away objects - and every time you do so, the result is a fresh, updated look. 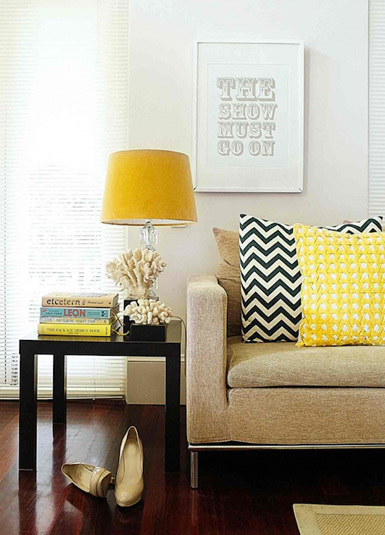 For some inspiring tips and ideas, read on...(and please feel free to share your own styling tips!). 1. Cluster together interesting objects in various sizes on an end table. 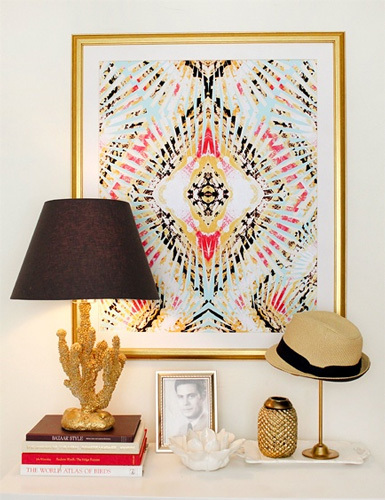 Choose a fabulous lamp that doubles as a beautiful accessory! Adding a vase of fresh flowers is a great way to add color and texture. 2. Group together several vases in different colors and sizes on a buffet or console table. 3. 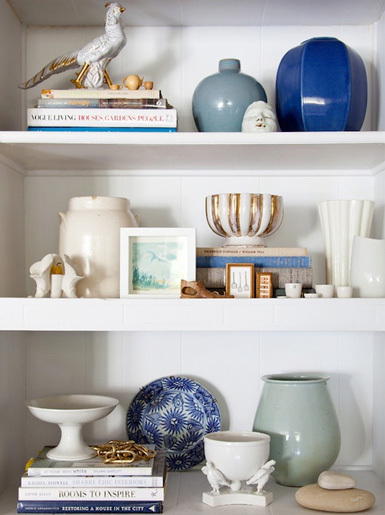 Bookshelves are a great opportunity for displaying collections, vintage finds, dishes and more. Balance things out with stacks of books and be sure the objects vary in height and shape (to many small objects will look like a cluttered mess; to many large items the same size will look boring). 4. 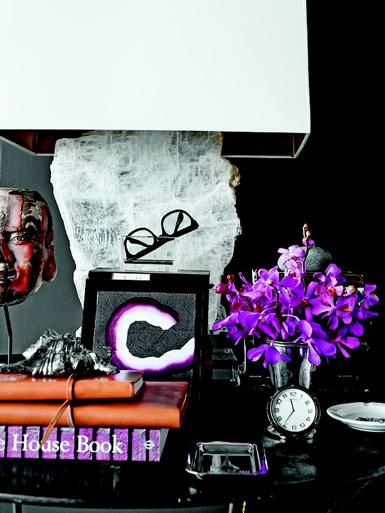 As you'll notice in many of these photos, stacks of beautiful coffee table books are always great for accessorizing. 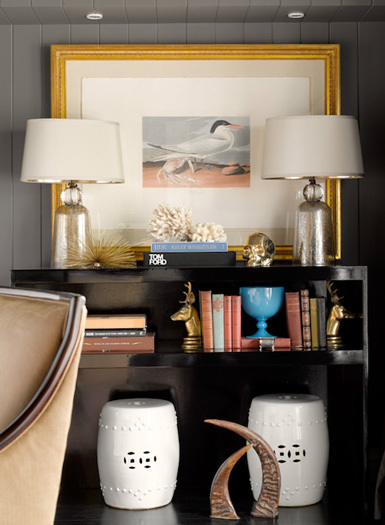 The short lamp on this console table is raised up by being placed on a stack of books. 5. Again, stacks of colorful and interesting books on art, travel, design, photography, are the perfect accessory! 6. The symmetrical lamps and stools create balance on this console table, allowing for mixed objects and books to stand out. 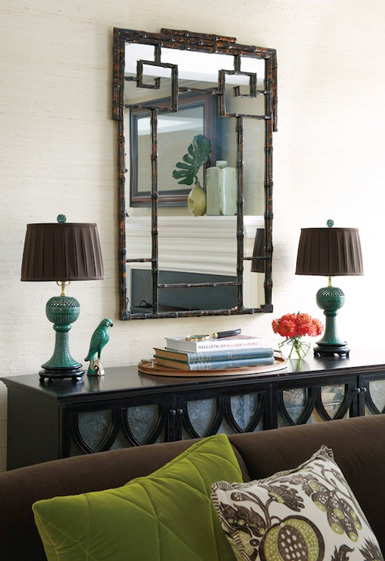 Remember, metallic accents are a nice way to create interest and dimension! 7. 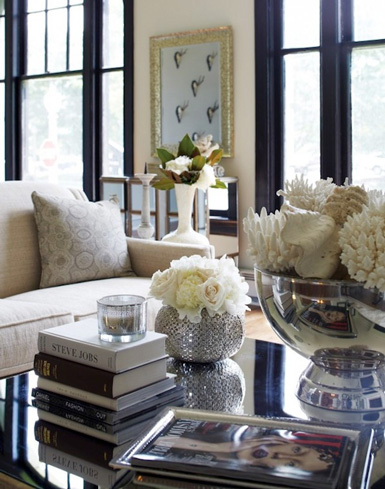 A large silver bowl filled with coral and shells is a great way to accent this mirrored coffee table. 8. Coral and books - timeless accessories! 9. 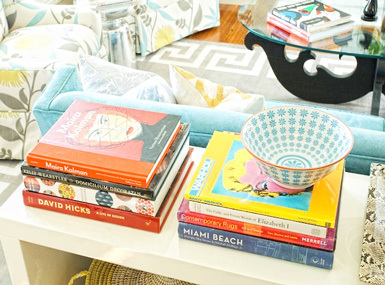 Books placed on a large oval tray look nice and organized. 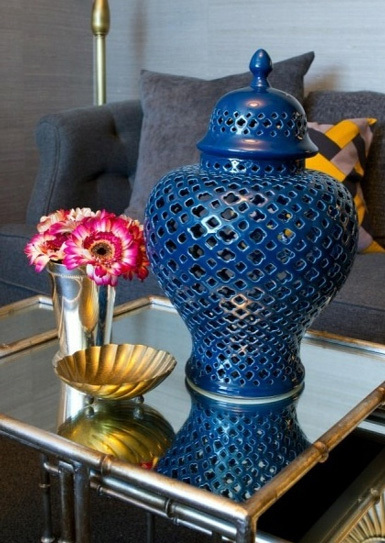 Love the pop of color with the vase of flowers! 10. Accessories always look best grouped in odd numbers - a group of 3 usually looks best! P.S. 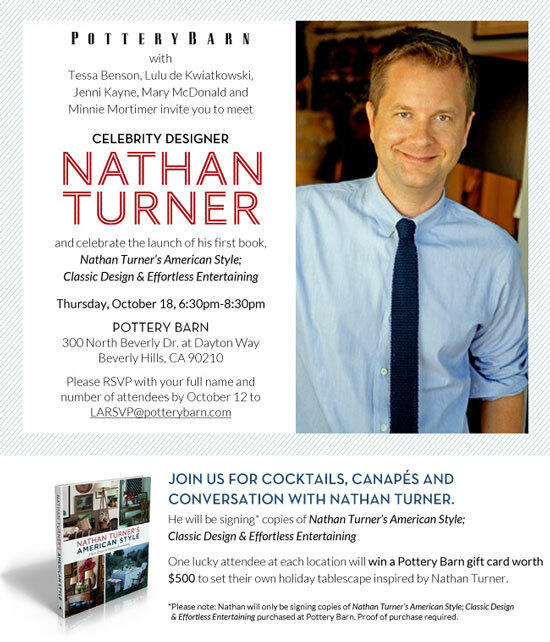 - Nathan Turner has just come out with his first book and you're invited to the book party tomorrow! Click on the invitation for details. Love this round with all the great tips! Sometimes accessorizing is all about trial and error - you just never know what will work until you try! I love the grouping of several vase! 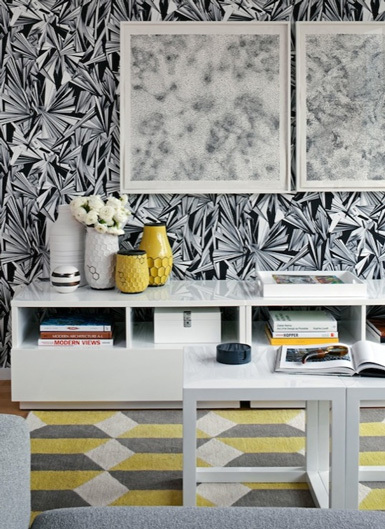 Such an easy trick to make a space look great! And, I never realized that this whole time, threes look best! I am a big fan of stacks of coffee table books as table decor. LOVE these vignettes! Love all these ideas...thanks for a beautiful post! Thanks for the beautiful examples! I want to go restyle my rooms now! I love using bookshelves to cluster accents and collections together. These are all fantastic!